The British Parliament’s Clock Tower (more commonly known as Big Ben) is leaning north-west by 0.26 degrees, or 17 inches (43.5cm), according to documents that were recently made public. 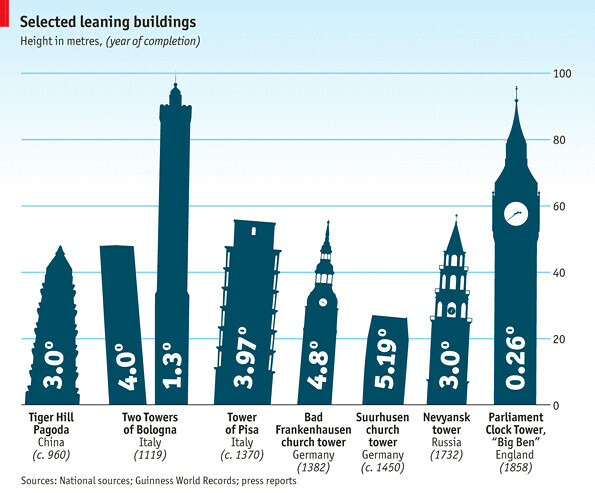 But Big Ben isn’t alone; architects have been correcting the Leaning Tower of Pisa since the 1170s when it was still being built. Germany’s Leaning Tower of Suurhusen, which at an angle of 5.19 degrees holds the Guinness World Record for the most tilted tower in the world, dates back to the 1450s. In modern times, many buildings have been designed at a deliberate slant. The 165-metre Montréal Tower, finished in 1987, is the world’s tallest man-made leaning tower and inclines at a 45-degree angle. In 1996, the Puerta de Europa in Spain was completed with two towers sloping towards each other at a 15-degree angle. Late this year the Capital Gate is set to be finished in Abu Dhabi at a slant of 18 degrees. As we hum “Lean on Me” to ourselves, we might send soulful birthday greetings to Robery Leroy Johnson; he was born on this date in 1911. 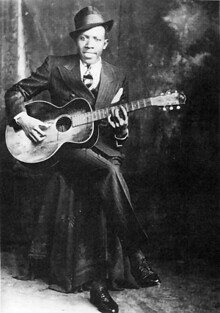 A master of the Mississippi Blues, Johnson’s guitar work and vocals have been hugely influential: he ranks fifth on Rolling Stone‘s list of all-time greatest guitarists, and is cited by Eric Clapton as “the most important blues singer that ever lived.” But this regard developed posthumously; during his lifetime, Johnson was effectively unknown– an itinerant, playing juke joints and street corners. So perhaps it’s not surprising that a legend has arisen around Johnson: as a young boy committed to music, he was “instructed” to take his guitar to a crossroad near Dockery Plantation at midnight. There he was met the Devil who, after bargaining for Johnson’s soul, took the guitar, tuned it, played a few songs, and then returned it– giving Johnson his otherwordly mastery of the instrument.